Ouray County Road 4 viewpoint. The author stands next to his motorcycle at the viewpoint at Mile 4 with the Sneffels Range in the background. Note Ridgway Reservoir way down below. A passing tourist snapped the picture. Ouray County Roads 2 and 4 are often overlooked by visitors who want to climb to dizzying heights in the San Juan mountains. Now don’t get me wrong, because I love doing the same thing. But close to home are two readily-accessible roads that offer access to Billy Creek State Wildlife Area, along with spectacular views and wildflowers. The roads, shown in the GPS track below, are easily reached from US Hwy 550, just north of the Pa-Co-Chu-Puk Campground at Ridgway State Park. This post tells you how to find these great roads and gives you a sample of the views and wildflowers I captured on camera yesterday afternoon. Let’s suppose you’re renting a Jeep, but that’s tomorrow. What to do today? 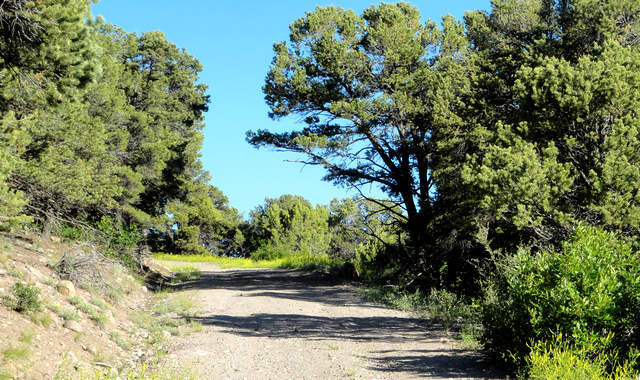 If you have a conventional 2-wheel-drive sedan, you can easily travel up County Road 2 and also up to the top of the ridge on County Road 4B, enjoy the incredible views, then turn around and retrace your steps. The road is a bit rutted, but time will knock the ruts down even more. Now, let’s suppose that while you’re waiting for that Jeep you have your SUV or pickup truck. You can easily add County Road 4 to your itinerary and see even more. Pay attention to where there are some rocks embedded in the road surface and you’ll be fine—I don’t recommend it for low-clearance highway vehicles like our Prius. If you take your dual-sport or dirt motorcycle, note that there is some scree. Also note that parts of CR 4 border private property, so please obey the “no trespassing” signs and stay on the road. Also please note that vehicles going uphill have the right of way (but use common sense). Turn to the east on County Road 4 and you'll see this. Bear left where it forks with Pinion Drive. Billy Creek State Wildlife Area Beckett Tract sign. Bear left to stay on CR 4. From Ouray, drive north to Ridgway. Keep on going, about nine miles. You’ll pass the Pa-Co-Chu-Puk campground—in another half mile you’ll find the turn onto County Road 4. If you’d prefer the tamer County Road 2, travel a couple miles further north on US Hwy 550 and you’ll see this sign on the east side of the road near a small collection of homes and the big metal maintenance building for Billy Creek. Ouray County Road 2 entrance. Follow the gravel road. Before looking at the wildflowers, let’s take a look at the GPS track below that highlights both roads. You may want to print this map and take it with you. Ouray County Roads 2 and 4, annotated for your use. See text for descriptions. Note there are primitive campsites near the intersection of CR 2 and CR 4A. Observe the signs. If you’re bringing ATVs along, this is where you’ll want to park and unload. Here's the view from the parking area at the easternmost end of CR 2. In the fall this field is dotted with hay rolls and is gorgeous. It's quiet here and there's plenty of room to park, plus a trail to go further into Billy Creek on foot or horseback. When I was up there yesterday evening, I found wildflowers everywhere, especially up toward the intersection of CR 4A and CR 4. I stopped to take a picture of one and ended up spending quite a bit of time capturing pictures of others. This is Thistle. I didn't see the insect until I looked at the photo on the computer. Fairy trumpet. Look closely at these and you'll see the ends flare like a trumpet. Continuing the insect theme, these pretty white flowers are at the intersection of CR 4 and CR 4A. The biome here is pinion pines mixed with junipers and scrub oak. That's CR 4. So, there you go! A low key, straightforward ride through some beautiful areas with gorgeous views. This is one of my favorite rides! 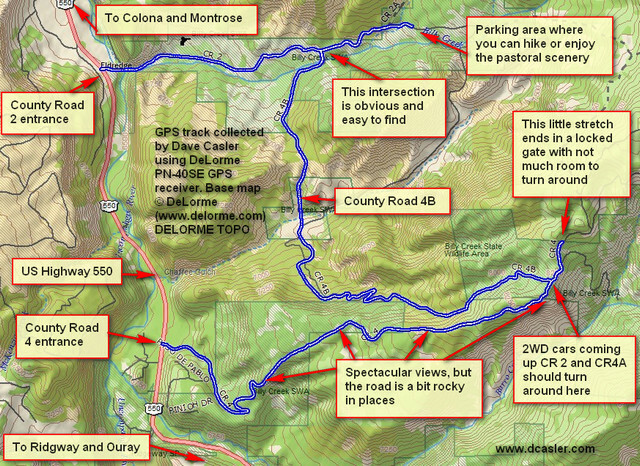 This entry was posted in GPS Tracks, Motorcycling, Ouray County, Wildflowers and tagged Cimarron Range, Ouray County Road 2, Ouray County Road 4, Sneffels Range. Bookmark the permalink.